First off, I apologize for my last post. I re-read it and cringed at how poorly written it was. While I know my posts are never 100% perfection, a post about resolutions should have been more fluid and coherent than that high school level diary entry. I doubt I will blog more often than I have been lately, but I will at least make a more concerted effort to give quality posts each time, making your reading my blog more worth your time and mine. As I mentioned in my last post, I registered for a Hot Hula fitness instructor's training workshop, and it was this past Saturday! The workshop really opened my eyes to a new understanding of fitness and culture, and I met other trainers from around the island who are absolutely inspiring. I wanted to share some thoughts on this format, in case anyone was interested in learning more about Hot Hula. I grew up dancing Polynesian dances. I also grew up trying to dance anything I could get my hands on. This led me to dip my toes in all kinds of dance genres, from ballet to hip hop, to ballroom, to folk, and everything in between. I have also choreographed dances and musical numbers throughout my life. Not anything spectacular -- but if you're looking for not spectacular, I'm your girl! :-) I love to dance, and to perform in general, but I'm too old to even start to pursue it professionally. ("Don't ever say you're too old!" Pro dancing is an exception to this statement.) When I first heard about this back in 2010, not only did I think it was brilliant (and about time, I was tired of Zumba already! ), but it was something that I could do. Something that kept me doing what I love, sharing (in a small way) the cultures that I love, and staying fit for the rest of my life. As a dancer, training to be an HHF instructor was illuminating. The first thing our master trainers told us was that the primary reason HHF was created is fitness. That means you're not supposed to come to a HHF class to learn how to hula, or to learn how to fa'arapu, or to learn our cultures. You come to get a workout. This should be obvious, but when you live in the land of hula, your paradigm for this format needs to shift. Thankfully I do live in Hawaii, and I can tell people "if you wanna learn real hula, join the halau down the street," or "if you wanna see real Tahitian, go to Tahiti Fete." But if you are looking for a fun dancing workout that takes a break from Zumba and Hip Hop Abs, come check us out! "The moves are modified to give you a workout." Almost every move that we know in the dancing world is modified for the Hot Hula format, and the statement above explains why. It makes sense when you consider that the creator, Anna-Rita Sloss, created this program from a fitness background, NOT a dancing one. In our manuals, the moves are written out for us and described in columns. The last column shows the different body parts that are being worked with this move. I need to study this section so I can have a better understanding of the exact workout class members will be getting, and let go of my pre-conditioned "proper form." "You teach the siva exactly as it is and nothing else." The siva is the bread and butter of the workout, and Anna-Rita has already created 9 of them for us. This was the most disillusioning part of my training. I love to choreograph. I love to fuse different kinds of dance styles together. I love to create a dance from a song of my own choice, and I thought fitness instructors could do that. So of course, I was bummed. But here is how the reason was explained to me: it keeps the fitness format consistent no matter where you go and who teaches, and it keeps from liabilities that come with instructors doing their own thing. For example, one master instructor went to someone else's HHF class, and that lady did fa'arapu all the way down and duck walks. In Tahitian, that's awesome; in HHF, that's bad for your knees. And if someone's knees get messed up because they did duck walk, they could sue Anna-Rita for this one instructor's deviation. "Start on a high; end on a high." This one isn't a dealbreaker or anything, but it's something I personally have a big problem with. What I mean is that when I am in front of people, I don't smile. Like ever. (Except for when I dance and do Broadway-type shows -- because I have to.) Even when I was a dance instructor, I never smiled or exuded enthusiasm and energy. I'm guessing it's a mental thing -- my purpose teaching dancing was just to teach them the dance. 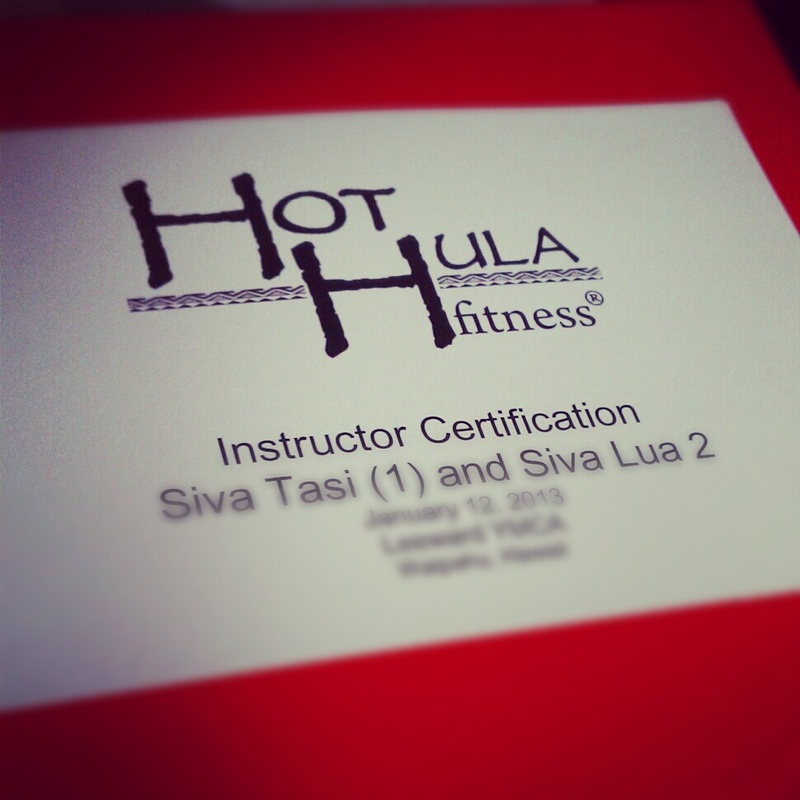 In Hot Hula, my purpose as their instructor is to give them the Hot Hula workout experience. The master trainers told us, "You give them 50%; they'll give you 15%. So if you want them to give you 100%, you have to give them 130% and more!" This concept is definitely out of my comfort zone, but I know I'm going to have to work on it if I want people to have a good experience at my class and come back again. So yeah, this is definitely a new adventure for me. But 2013 is all about being better than 2012, and I know that Hot Hula fitness will give me that edge. I am excited and nervous and I hope that people who come to my class will benefit from it just as much as I will. So if you're ever in the North Shore area, come February I will start my classes. I don't know where or when yet, but I'll keep you posted. YES!! glad you are on FB again!! also, this is way cool! def keep me posted! is HH only on the island? lol.. i need something. i don't like the hype about Zumba, but would love to do something like this! also, i didn't know you liked to choreograph! so cool! !